In the early 1980s, no single piece of jewelry represented a fairy tale romance more than Princess Diana's engagement ring. The Princess of Wales captured the public's heart, and her exquisite taste in fine gems became an icon for the royal feeling every bride wants on her wedding day. In February 1981, the elusive Lady Diana Spencer was thrust into the spotlight after Prince Charles' proposal, making her the soon-to-be wife of the heir to the British crown. The official engagement announcement was made February 24, 1981, and the couple immediately began preparations for the wedding of the decade, one that is still fondly reminisced about today as everything a fairy tale should be: acres of sultry silk fabrics, cascading flowers, a royal procession, and a beautiful princess greeting her adoring public. With all the lavish details of the wedding, it might be assumed that Princess Diana's engagement ring would be overshadowed with the glitz of the occasion, but that was not the case. The stunning ring was a focal point throughout the couple's engagement and was frequently spotted as Diana attended various official functions in her new capacity. The world turned to this commoner-turned-princess for style trends, and the first fashion the public embraced was from her engagement ring. Prince Charles initially proposed without an engagement ring, insisting that Diana consider the implications of the role of his wife - being a couple under constant camera barrage and the pressure to provide the next generation's heir - before accepting. Diana, however, needed little encouragement, and after she accepted a selection of engagement rings was presented for her consideration by Garrard Jewellers. Diana choose an oval blue sapphire engagement ring that weighed in at an astounding 18 carats and was surrounded by 14 small diamonds in an elegant cluster setting. Unlike many celebrity engagement rings, when the public must hypothesize about an engagement ring's price and jewelers are sworn to discretion and secrecy about their client's privacy, the public knew the cost of Diana's engagement ring instantly. It was actually a piece in the regular Garrard catalog and therefore could be purchased by anyone, for the hefty price of 28,000 British pounds, or the equivalent of $65,000 (at 1981 exchange rates). At first, the engagement ring caused a bit of a stir both among the royal family as well as the public when it was discovered that it had not been especially designed for Diana. As with any bride-to-be, however, Diana's preference overruled those concerns, and the rich blue sapphire became an elegant symbol of the couple's commitment. A family that routinely sports thousands of dollars of fine jewelry does not select just any jewelry designer to supply their needs, particularly for something as poignant as an engagement ring. Garrard Jewellers has actually been the official crown jeweller for the British monarchy since 1843, and they have designed both personal and public pieces of great intricacy, wealth, and prestige. Garrard has been responsible for maintaining the wealth and beauty of the British crown jewels, including resetting stones as needed, and their work has included such monumental pieces as fashioning Queen Mary's coronation crown in 1911 and working with the famous Cullinan gems. Therefore, despite the fact that Princess Di's engagement ring was actually a catalog design, it was still a piece of distinction and worthy of notice as one of the world's most famous gems. Despite the eventual souring of the royal marriage, the ensuing divorce, and Princess Diana's tragic death in August 1997, her style and design flair continue to be influential, particularly for jewelry. 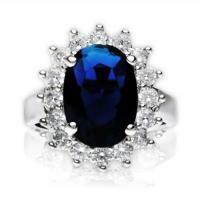 Her choice of a sapphire over the more traditional diamond paved the way for non-diamond engagement rings to gain popularity and notoriety as luxurious engagement rings, but her simple classic taste for an oval diamond shape paid respect to the time honored symbolism of elegant rings. Today, replica rings are available from many retailers, and while they do not mirror the precise quality and dimension of Princess Diana's engagement ring, they are immediately recognizable because of her widespread influence. A replica ring may be made from real semi precious gemstones or it may be fashioned from cubic zirconia or other crystals. The least expensive replicas run from $40-80 depending on the overall size of the ring and the quality of the recreation, while true gemstone replicas depend largely on the quality of the sapphire and diamonds used. Princess Diana, despite her relatively brief career in the public spotlight, had a heavy influence on fashion, style, and design, starting with her luxurious engagement ring. Today, brides-to-be can feel less self-conscious about foregoing traditions and choosing unusual engagement rings to suit their style and preferences - they are, after all, in very good company.